134-1　NAME : 管理人　 2014/05/26 23:04:08 NEW! 134-2　NAME : ふくねこ　2014/05/27 21:04:05 NEW! 134-3　NAME : 管理人　 2014/05/28 16:26:08 NEW! 134-4　NAME : ふくねこ　2014/06/21 21:55:24 NEW! 134-5　NAME : 管理人　 2014/06/22 02:14:13 NEW! 133-1　NAME : 管理人　 2014/03/10 00:57:31 NEW! 133-2　NAME : こうじ　2014/03/10 16:56:21 NEW! 133-3　NAME : 管理人　 2014/03/10 18:29:51 NEW! 133-4　NAME : こうじ　2014/03/10 20:41:16 NEW! 133-5　NAME : 管理人　 2014/03/10 21:39:08 NEW! 133-6　NAME : こうじ　2014/03/11 07:05:24 NEW! 133-7　NAME : こうじ　2014/04/22 14:55:05 NEW! 133-8　NAME : 管理人　2014/04/23 13:59:40 NEW! 126-1　NAME : 管理人　2014/02/12 09:34:58 NEW! 126-2　NAME : ふくねこ　2014/02/13 12:29:27 NEW! 126-3　NAME : 管理人　 2014/02/13 18:56:02 NEW! 126-4　NAME : Merkatz　2014/03/21 11:36:04 NEW! 126-5　NAME : 管理人　 2014/03/21 20:16:11 NEW! 132-1　NAME : 管理人　 2014/02/20 19:48:33 NEW! 132-2　NAME : 管理人　 2014/02/20 22:28:27 NEW! 132-3　NAME : オレンジ　2014/02/21 11:14:37 NEW! 124　Piper Saratoga StabilatorとAnti-Servo Tabについて NEW! 124-1　NAME : 管理人　 2014/02/07 20:28:50 NEW! 125-1　NAME : 管理人　 2014/02/07 20:23:22 NEW! 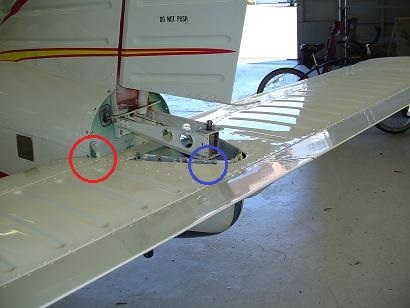 Trim tab は動翼とは逆方向に動くので、操縦桿にかける力を減らすことができるというのは納得がいくのですが、動翼と同じ方向に動くのにAnti servo tabはどうしてトリムの働きも出来るのでしょうか? 123-1　NAME : 管理人　 2014/01/31 11:28:50 NEW! 123-2　NAME : ふろあ　2014/01/31 12:23:12 NEW! 123-3　NAME : 管理人　 2014/01/31 12:57:22 NEW! 123-4　NAME : ふろあ　2014/01/31 13:39:41 NEW! 123-5　NAME : 管理人　 2014/01/31 14:36:04 NEW! 123-6　NAME : 管理人　 2014/02/01 00:59:25 NEW! 123-7　NAME : ふくねこ　2014/02/02 00:07:12 NEW! 123-8　NAME : 管理人　 2014/02/02 12:44:01 NEW! 123-9　NAME : 50おやじ　2014/02/02 20:25:59 NEW! 123-10　NAME : 管理人　 2014/02/02 22:25:29 NEW! 123-11　NAME : ふろあ　2014/02/06 14:05:31 NEW! 123-12　NAME : 管理人　 2014/02/06 23:05:09 NEW! 123-13　NAME : 高木　雄一　 2014/02/07 00:22:33 NEW! 123-14　NAME : ふろあ　2014/02/07 03:17:15 NEW! 123-15　NAME : 管理人　 2014/02/07 20:16:59 NEW! 120-1　NAME : 管理人　 2014/01/07 07:15:14 NEW! 120-2　NAME : あずま　2014/01/07 14:19:31 NEW! 119-1　NAME : 管理人　 2013/12/28 23:16:02 NEW! 119-2　NAME : 高木 雄一　 2013/12/30 02:36:48 NEW! Tower: Cessna 915 left turn approved. If able, maintain 1,500 ft or below for the traffic to the Andersen. Cessna: Roger, left turn, and at or below 1,500 ft, 2915. 119-3　NAME : 管理人　 2013/12/30 03:10:31 NEW! 119-4　NAME : ふくねこ　2013/12/30 10:59:13 NEW! 119-5　NAME : 管理人　 2013/12/30 11:18:58 NEW! 119-7　NAME : 高木 雄一　 2013/12/31 01:17:15 NEW! 119-8　NAME : 管理人　 2013/12/31 08:31:55 NEW! 119-9　NAME : ふくねこ　2013/12/31 13:54:01 NEW! 118-1　NAME : 管理人　 2013/12/25 10:17:23 NEW! AIMで書かれてるのは "An approach over an airport or runway following an instrument or a VFR approach including the go-around maneuver where the pilot intentionally does not make contact with the runway." 118-2　NAME : ふくねこ　2013/12/25 20:51:31 NEW!